GoDaddy became a household brand by having risque television advertisements shown during the Super Bowl. Recently, the company halted its famous Super Bowl commercial campaigns, focusing on other marketing efforts instead. 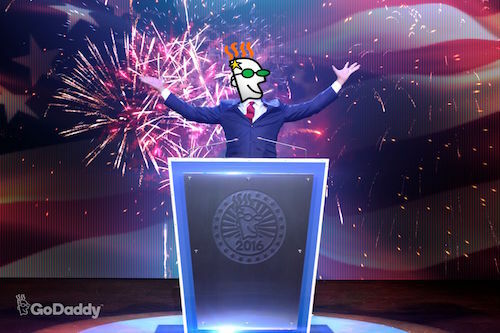 I just read a news release announcing that GoDaddy will be advertising during the US Presidential election debates. It is very possible that the debates will draw an even larger US-based audience than the Super Bowl. Obviously, the television spot doesn’t include anything too risque and offers a special price for registering a .com domain name. The first television spot was uploaded to YouTube this morning, and I embedded it below. I believe the company will be rolling out additional television ads for the subsequent debates and throughout the remainder of the election season. Interestingly, the television advertisement campaign is co-sponsored by Verisign, and it promotes .com domain names as you might expect. The first Presidential election debate takes place on Monday, September 26th at 9pm Eastern. Interesting commercial. Funny how they say $2.99 when actually you need to register for 2 years to get that price. See end of commercial. So your looking at about 9 dollars on average. Additional year 2nd year is 14.99 for second year. Still great deal but why not just give them $2.99 for first year. A bit misleading. People don’t have time to read the fine print on restrictions*. Also why mess with flow of making the sale? IMO- They will lose probably 15-20% of conversions once they get to car because they think people will not catch this. Why start off a new client by doing tricks. It will fail because of this. You can take that to bank. It will probably be the most watched debate of all time. Godaddy could not choose a better time to advertise, it is the absolute pinnacle of when the poor delude themselves into a mindset when they see themselves, not as an exploited proletariat but, as temporarily embarrassed millionaires.